The serene surroundings of Cheshunt’s Lea Valley were interrupted when a man employed by CRT to collect their rubbish began swearing violently at a bin that looked like it had exploded. This new spot for a congregation of boaters, not because of their new-found love for Cheshunt, but as a result of CRT’s policy of forcing boats to ‘increase their range’ and with nowhere to dump their household rubbish the trash of a dozen boats was being crammed into a container the size of a large pedal bin. What was needed was something ten times the size. If a tap and an Elsan were located here the boaters in Cheshunt would have found themselves in canal heaven. CRT says it’s ‘committed to…improving facilities for boaters’. A Better Relationship Group (BRG) was formed for boaters to discuss concerns with CRT. Facilities are second on the group’s list of objectives (increased moorings being the first and increased enforcement being the last). The need for far more facilities cannot be denied, particularly west of Paddington. CRT’s own survey of ‘London’ facilities, from Bishops Stortford in the north to Cowley and Brentford in the south west (a lot of canal) revealed how poor facilities are; 9 Elsans, 15 taps, 5 pump outs, 9 rubbish points and 5 WCs, and some of these scarce facilities, such as the pump-out at Stonebridge lock are in poor working order, or are in complete disrepair, as is the case of the WC at Victoria Park which is now a distant memory. More boaters = more facilities? The increasing number of boats (14% in 2013 and 10% in 2014) means more revenue for CRT and should mean more facilities. CRT and BRG made some very modest proposals; 3 new pump outs, 2 new Elsans, 3 new water points and 4 oil collection points, but none of this work has been carried out. What is stopping CRT? They’ve admitted new facilities are necessary, they have the money, with a surplus of funds in 2014. If they were as pro-active about taps, bins and Elsans as they are about ‘enforcement’ there would be facilities at every other lock. Is it incompetence or some kind of ‘benign neglect?’ My own experience of their administration has convinced me they are incompetent. As someone once said, it’s like Kafka meets the Marx Brothers. There is a hypocritical corporate mentality at work. Behind the marketing machine with its cuddly website, the pretty signs and volunteers strategically placed at Camden for the tourist, behind the image of a progressive organisation that cares about boaters and the environment, is an antagonism to an alternative lifestyle and utter indifference to recycling and issues around housing. At the same time individual boaters, who are paying a licence fee, are subjected to the kind of monitoring usually associated with a police state and denied the facilities that every household in the country has a legal right to; a water supply that is easily accessed and rubbish disposal that is not a health hazard. CRT has said that it intends to, ‘educate boaters about cruising requirement’, but ‘continuous cruising’ requires actually facilities and not mere lip service to the idea of better facilities, in this respect it is CRT which is in need of education and not the boating community. 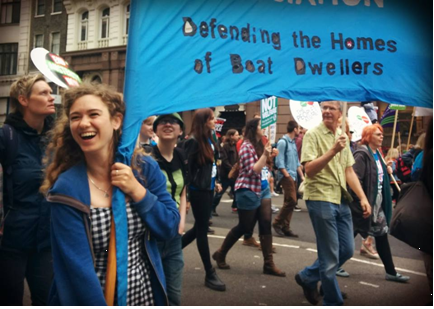 The London branch of the National Bargee Traveller Association (NBTAL) has launched a new case-worker group in a bid to help London boaters who are affected by enforcement and the new Canal and River Trust (CRT) policy on refusing licences. The case worker group keeps up to date with pooled knowledge of the current implementation of the new enforcement policy and the legal framework under which the policy sits, and can give assistance on ‘how far is far enough’ questions, re-licensing, sighting data queries, benefits, disability allowances and adjustments and other related advice. is a live-aboard, then the next step is they will likely take the boater to court for having no licence and to seize the boat and remove it from the canal. For an unspecified trial period, CRT are offering temporary 3 or 6-month “restricted” licences to affected boaters so they can “mend their ways”. This offer of restricted licences is “while boaters get used to the new regime”. After a request from the NBTA, CRT have stopped charging premium rates for these “restricted” licences and the cost is now pro-rata to the full licence. WHAT DO I DO IF CRT REFUSES TO RENEW MY 12 MONTH LICENCE? CRT’s new enforcement policy has meant many boaters have had renewal of their 12 month licence refused and a 6 or 3 month license offered instead. How far is ‘far enough’? CRT stated on 6th March: “Whilst this means that we cannot set a universal minimum distance for compliance, we can advise that it is very unlikely that someone would be able to satisfy us that they have been genuinely cruising if their range of movement is less than 15-20 miles over the period of their license. In most cases we would expect it to be greater than this. The policy is now three months old and hundreds of boaters have been affected. the log they have of your movement during the previous licence period. Clearly mark the email as a ‘Subject Access Request’ and ask for your sighting data and any other information that CRT holds on you. CRT can lawfully charge you up to £10 for this. Should I accept a restricted licence? opportunity given to remedy the situation and the retrospective application of this policy. To lodge a Level 1 complaint, use the template provided on the Kanda website or contact the NBTA caseworkers for help. Download the Canal and River Trust’s “MAKING A COMPLAINT” guide here. It can be challenged through the courts. CRT’s new enforcement policy is highly unlikely to be considered lawful if you sit tight, are prepared for the stress of a court case and you have complied with the legislation and moved a reasonable amount at least every 14 days, as the the law (The 1995 British Waterways Act) does not specify a minimum distance that must be travelled to comply. Sun day 19 April, NBTA hosted a family-friendly Towpath Gathering outside Victoria Park to celebrate the boating community whilst making a stand against CRT’s draconian new enforcement policy and recent licence refusals. Attracting over 200 people, the event sent a positive but pressing message – our colourful community is under threat. Boaters, supporters and local residents were given an insight into boating life with a floating marketplace where all were welcome to step onboard. From origami workshops, a museum, the Jam Butty and a record store, to live music, poetry and clown performances, visitors marvelled at the unique and eclectic mix of boaters, able to learn about the everyday lives of boat dwellers. for “not moving far enough”. As the event drew to a close, there was a real sense of achievement and pride. The boating community is undeniably considered special and is treasured by many, proven by the extensive support from all who attended the event and all the stories shared. Newsletter Article: CRT WITHDRAW PREMIUM RATES ON RESTRICTED LICENSES! Following NBTA lobbying, CRT will only charge boaters forced to take a 3 or 6-month licence the 12-month fee pro rata instead of the advertised higher relative cost of its shorter licences.